There was a blog-space challenge making its rounds this week, for posts and photos of “The Things We Leave Behind.” There have been great photos of, and posts about, crumbling architecture, changing cityscapes, found objects, etc. The challenge catches me in a nostalgic mood, having just moved back Stateside, so my mind has lighted on personal memories– earlier travels when my children were little. I’ll share just a few of those photos here. 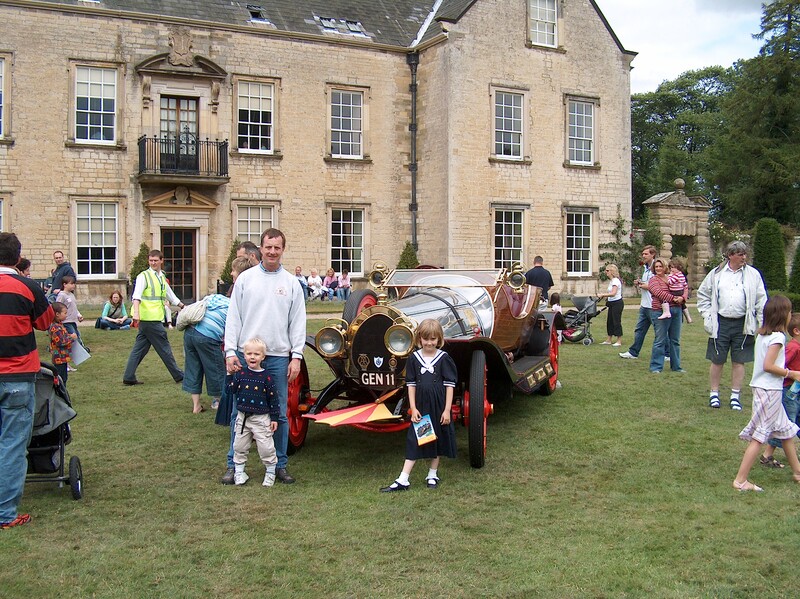 The first photos come from an early summer day in Yorkshire, England, when Chitty Chitty Bang Bang (the actual car from the movie) made an appearance at a local manor house one Saturday. The owner of the car, who had actually driven the car in at least one scene in the movie, was proudly displaying his picture-perfect auto and answering a frenzy of questions from fans of all ages. One lucky person, whose name was drawn out of a hat, got to go for a ride in the car. We didn’t make that cut, but we enjoyed ogling the iconic car anyway. It was a magical day. I look at the photos now, and it does feel like an era left behind: our lives in England, our children’s wide-eyed elementary and preschool years, and a certain fabled-space that those two things created in their synergy. It’s funny, but when I looked at a number of old photos that I might post of “Things We Leave Behind,” I found that my present nostalgic filter made me see each of them differently. 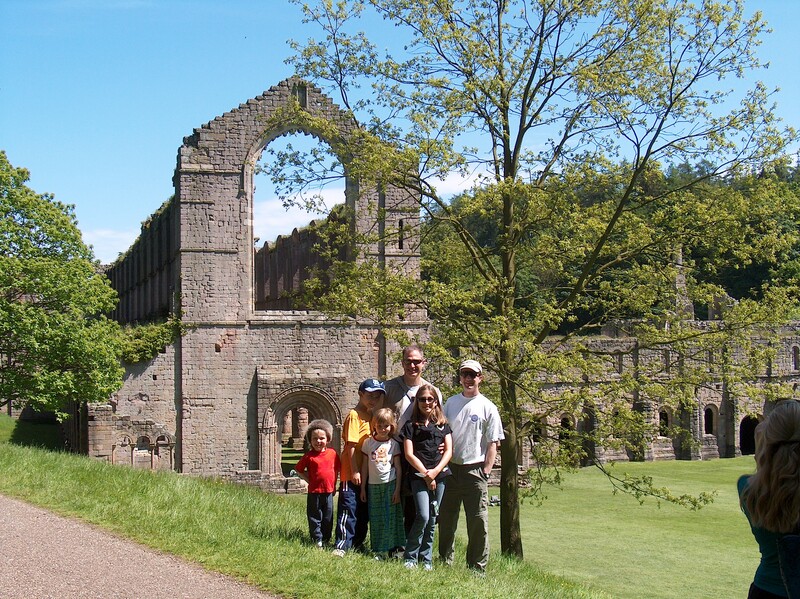 For example, this photo from Fountains Abbey, in Yorkshire. 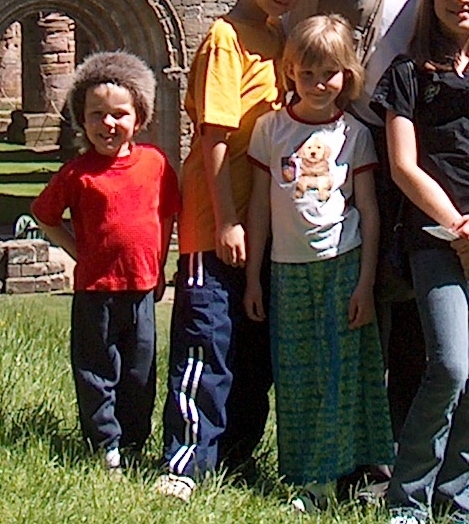 I went looking for a picture of the impressive ruins of the Catholic abbey that Henry the VIII closed down (but which partially stands proud to this day), but what I saw immediately in the photo was my son’s love of the Davy Crockett coonskin cap which he wouldn’t take off of his head, even in the summer heat. It was a funny phase. . . but eventually left behind. 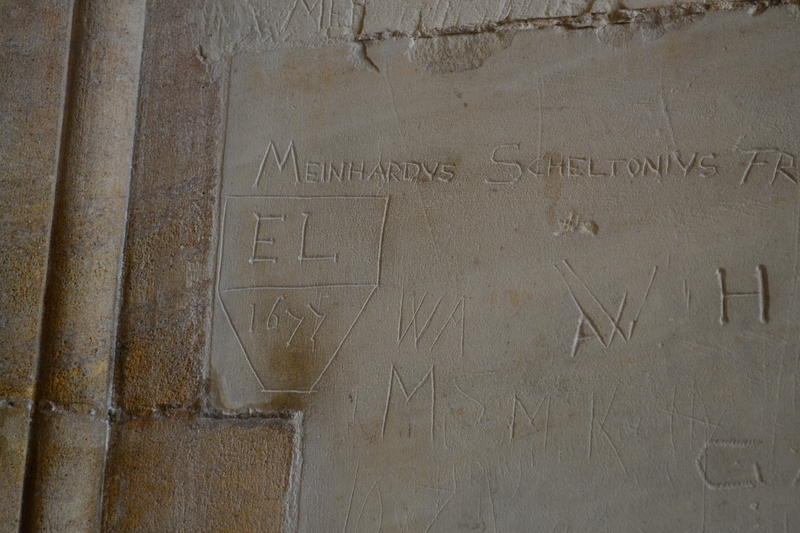 When I looked at this photo of graffiti on the walls of Kings College Chapel, in Cambridge, England (some of it dating back to the 1600’s), I immediately remembered a lazy afternoon stroll along the Cam River and “the Backs” of the university with my daughter. And I also thought of the graffiti on the walls in the Tower of London, some of it from prisoners kept there hundreds of years ago, and I remembered my children’s amazement at it, and their love of British history when it was so solidly placed in front of them, and so brilliantly re-animated by the British book, TV, and stage series “Horrible Histories.” Living elbow to elbow with history is something that Europeans do very well, but Americans a little less so. Maybe that’s just a matter of circumstance. Europeans simply have so much more history to steep in than Americans, and it’s in your face on every street corner. Still, it offers a certain long view of the world that is so very valuable–a sense that we don’t really “leave behind” things, so much as we build on and around them. Like childhood and Chitty Chitty, there are certain things that we should never totally leave behind–and couldn’t, even if we wanted too. Thanks for reading, Carol! Say Hi to the family for me! Pawsome memory. Thank you for sharing it. Absolutely! But the child catcher terrified me! Lovely! Have you ever seen the stage musical version? The Child-catcher is very frightening in that! 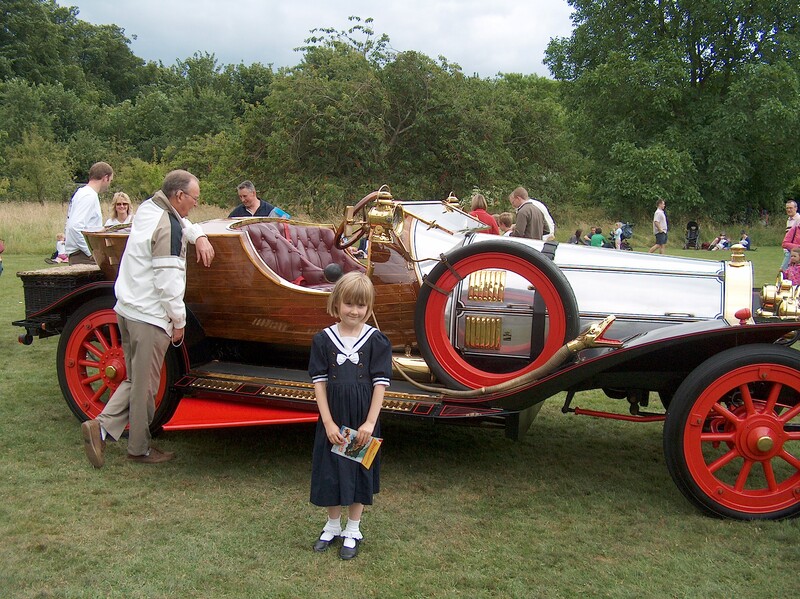 I remember at my daughter’s prom 4 years ago, someone’s Dad delivered them in a replica he had made of Chitty Chitty – complete with wings and dry-ice. 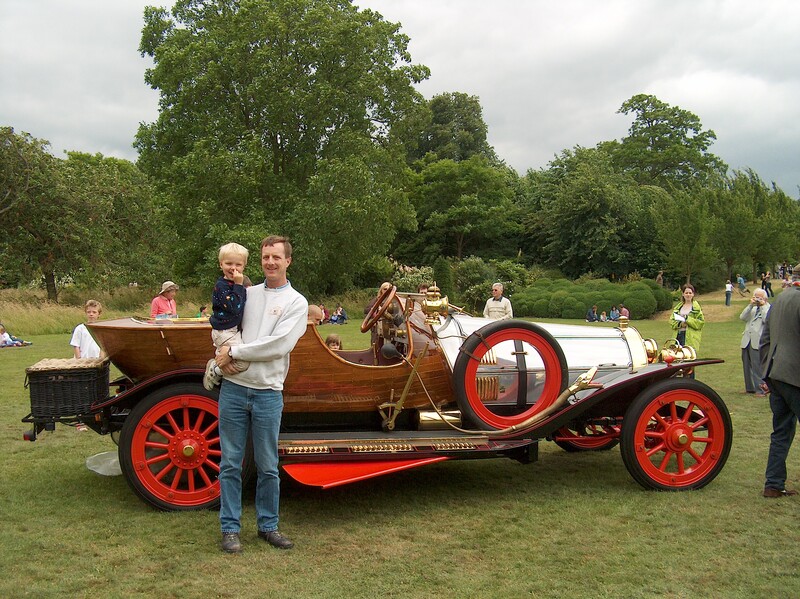 Wow– amazing dad to recreate Chitty Chitty! Fun! We haven’t seen the stage show, although it was traveling the UK when we were there years ago– wish we’d seen it.